Exclusive design featuring an elevated Brushed Metal Frame attached to a High-Gloss Lucite Board. Custom Layout with USPTO Patent Seal, Patent Number, Inventor, Title and others. 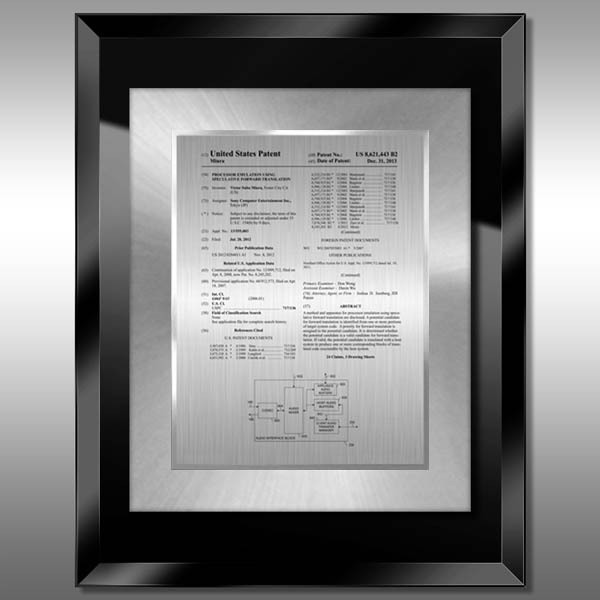 Patent information is engraved on a Silver HD Plate and mounted on a beveled glass plaque. This Patent Plaque - Hi-Def Dimensional HD-EZ13 is part of our Modern Series of products, check out other products & options available in the Modern Series of our selection. This Patent Plaque - Hi-Def Dimensional HD-EZ13 can be modified to your requirements and is available for your corporate award programs.